It is one of my (now not so) secret desires to write a book about traditional beers and fruit wines. They are cultural sturgeon--artifacts from a far, far earlier age. Whether it's ancient African or Peruvian beer or Indian palm wine, sitting down with a glass is a ritual you can imagine ancestors doing 100 years ago. Add tepache to the list. Until Nat West told me about a batch he made last year, I'd never even heard of it, and am still 99% ignorant. Fortunately, in these modern times, we have the Google. This hard-to-find drink called tepache — pronounced "tay-PAH-chay" — is a lightly fermented cider typically made from pineapple and seasoned with spices such as allspice, cinnamon and clove. An unrefined brown sugar called piloncillo is added for sweetness and depth. It is not uncommon for oranges, apples, tamarind or other fruits to find their way into the mix. Traditional versions found in Mexico usually demand that it be made in a seasoned wooden barrel called a tepachera, but because of the lower cost and ease, most tepache made in Chicago is fermented in glass or plastic jars. After one to five days of fermentation, tepache takes on a slightly acidic effervescence and a surprisingly pleasant funk, characteristics also found in other styles of fruit ciders. If tepache is left to ferment for much longer, a sharp vinegar flavor starts to creep in. Home-brewers often reinforce their own renditions with beer. It is invariably described as lightly alcoholic, which given the brix of pineapple, seems odd. (The spiky fruit contains about as much sugar as an apple and therefore, fermented, should be 6% or so.) But there's also this fascinating fragment from the dictionary: "an intoxicating beverage made from pulque and coarse sugar with timbe used to retard fermentation." That's inaccurate, apparently (pulque is a different ancient fermented beverage), but this thing called timbe is an interesting clue: "the bark or root of any of several Mexican trees and shrubs (esp. Acacia angustissima and Calliandra anomala) used in the manufacture of tepache." 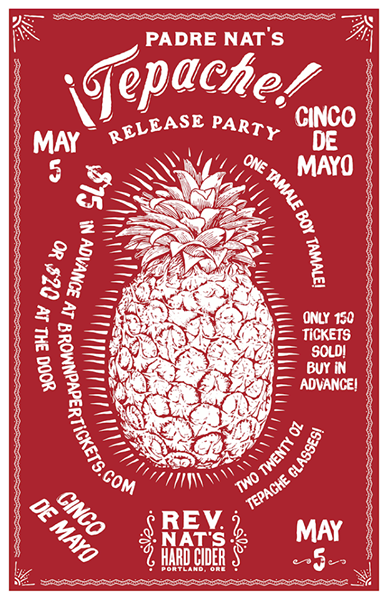 Well, Portlanders will have a chance to look more deeply into the phenomenon on Cinco de Mayo as Nat releases this year's batch. Tepache is a traditional Mexican drink, frequently consumed out of a plastic baggie with a straw, sold by street vendors in Jalisco and made at home. We make our ¡Tepache! with fresh Costa Rican pineapples, pure Michoacan piloncillo (raw unrefined sugar) and a blend of three spices – No Apples! The fermentation happens on the scales and rind of the pineapples, imparting a deep and unique flavor. Details about the event and tickets are here, and if you see Nat, you can ask him how it's made. Is There a High Culture of Beer?